In a construction site fall accident, workers are often performing their duties on scaffolding or a roof that either gives way or fails to support the weight of the employee. There can be many different reasons, which can include defective equipment, lack of safety precautions or bad weather. In Illinois, there are very specific laws that outline the type of safety measures that need to be implemented into a work site to help ensure the safety of the workers. Unfortunately, many of these regulations are not followed and consequently, workers get injured. 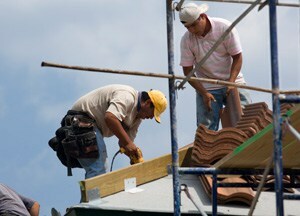 Have you or someone that you love been injured after falling at a construction site? Did you know that you or that victim may be eligible to file a damages lawsuit? For more than 30 years, the law offices of Goldberg Weisman Cairo have been helping injured workers to fight for the justice that they deserve. In fact, we are the preferred attorneys for many unions and trade organizations in the state and as a result, our highly trained attorneys have DETAILED knowledge of the issues that many injured workers and their families face. To find out if we can help you, call us today at 1-312-464-1234 or contact us online “here“. While most head and spinal cord injuries occur in car and truck accidents, these are also common injuries from falls on Chicago construction sites. These sudden, forceful blows to the head, neck and back can result in devastating, often permanent injury, including traumatic brain injury, paraplegia and quadriplegia. Workers who have suffered brain and spinal cord injuries often need substantial long-term medical care and may need day-to-day assistance with life tasks. Recovery from brain and spinal cord injuries is costly. If a loved one has sustained a brain or spinal cord injury and you believe that someone else is to blame, the Chicago injury attorneys at Goldberg Weisman Cairo stand ready to help. GWC has the network of experts, the experience and the substantial resources necessary to litigate even the most complex brain and spinal cord injury case. Example Case: Our client, an ironworker, suffered a serious spinal cord injury and became quadriplegic after falling off the roof of a one-story house because the decking sheets on the prefabricated metal building contained excessive amounts of oil. We secured a $10 million verdict from two manufacturers. At GWC, we are passionate about procuring full and fair compensation for construction workers and families who are suffering the devastating physical and emotional effects of brain and spinal cord injuries. These are not simple cases. Brain and spinal cord injuries involve complex medical issues. Your attorney will work with medical specialists to determine the extent of injury, the type of rehabilitative services needed, the extent of recovery that may be possible and the services you will need over the course of a lifetime. Medical experts can be costly. Not all law firms are equipped to extend their own resources over the length of time it may take before the extent of disability is fully known. But GWC is a large firm with the resources to invest in your case. The traumatic brain and spinal cord injury attorneys at GWC welcome the opportunity to answer your questions about fall-related injuries on Chicago construction sites.